I recently had to replace my copy of Mastering The Art of French Cooking because the spine had split and the pages were falling out. While flipping through my shiny new copy I came across a sauce Adrienne and I had never made: Sauce Parisienne. I don’t know why we never made it but it sounded like something I should try, at least once! It is a reduction of the liquid you use to poach fish – either stock or wine and water – a roux of flour and butter, egg yolk and cream. The result is a subtle taste of fish from the poaching liquid and lushness from the egg yolk and cream. 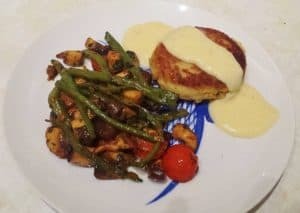 In Mastering, Julia suggests after dressing the fish fillets with the sauce you sprinkle them with cheese and finish under the broiler. That was the Old School part which I abandoned after testing it. But the sauce itself was delicious and easy – which is what we all want! 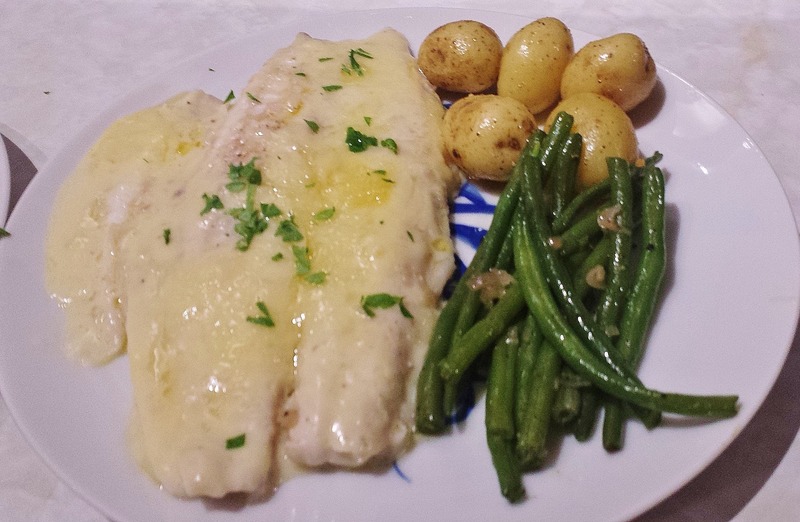 I ordered Dover Sole from our fishmonger and served it with the sauce, boiled potatoes and green beans that you see in the picture above. The sauce will keep in the fridge – I didn’t try freezing it – and works beautifully on fish cakes and even sea bass fillets.